Today is an early release day for the district. Buses will run approximately 2 hours early. Today is also the end of the 3rd six weeks and the end of the first semester. We have completed 80 days of this school year and will have 100 days to go in the second semester. The district will be out on Christmas break from December 19 – December 30. January 2 is a teacher workday. There will be no classes for students that day. Classes will resume at their regular time on Tuesday, January 3, 2012. I want to thank everyone for a great first semester. It went by so fast!! We have had a great start to the 2011-2012 school year. I know that the second semester will be just as good as the first. A reminder that our High School basketball teams will be playing tonight and Monday, December 19. Tonight, the girls teams travel to Leon for a district contest. The games start at 5:00. The boys teams will be traveling to Quitman tonight. Those games are scheduled to start at 5:00. On Monday, December 19, both the boys and girls teams will be hosting Malakoff in district action. The games will start at 3:00 PM. Approved the minutes of the November regular board meeting. Approved the 2011 audit report as presented. Approved a two-year extension with Life Touch Photography. Approved the end of course grading policy as presented. I wish everyone a very Merry Christmas and a Happy New Year!! Today will be an early release day for the district. Buses will run approximately 2 hours early today. Tonight, the EISD Board of Trustees will hold a public hearing on the Academic Excellence Indicator System report. The public hearing will start at 6:45 PM and will be held in the High School library. During the hearing, the board will review the AEIS reports for the district and campuses. In addition, the board will also receive information about violent and criminal acts, college attendance by EISD graduates, and a report on safe and drug free schools. Review 504 forms and procedures. Distribute framework for school board development. Consider agreement with Life Touch Photography for the 2012-2013 and 2013-2014 school years. Consider options regarding End of Course Exams grading policies. Review Policy Update 92 – first reading. Distribute instrument for superintendent evaluation. Where Does a Dollar Go in EISD? As of December 12, 362 school districts are now members of the Texas Taxpayers and Student Fairness Coalition. This coalition has filed a lawsuit against the state challenging the current school funding system. EISD is a member of this coalition. Another group of school districts have recently filed their own lawsuit against the state; however, the Texas Taxpayer and Student Fairness Coalition is the only group that is challenging the funding system in both equity and adequacy. The Equity Center recently published an article about the “weights” given to compensatory and bilingual education. EISD does not receive that much funding for bilingual education because we do not have that many bilingual students. However, we receive a large amount of funding through the compensatory grant. These funds are based on the number of students that receive either free or reduced priced meals. The greater the number, the more funds a district receives. Currently, all districts in the state receive 20% of this calculated number. For EISD, we receive a little over $1 million in compensatory funding. This is a major component of our state aid. In the article, it is pointed out that a recent Interim Committee study supported raising the weight for compensatory to 40%. In other words, EISD and every other district in the state, should be receiving double the amount of compensatory money that we currently receive. Although this study was commissioned by the Texas legislature, the recommendations were not adopted. Now, onto the title of this post. Where does a dollar go in EISD? We know how much money is budgeted for each category of expense in the district. Calculating the percent of the total budget is a straight forward operation. Based on the total 2011-2012 budget, you can use these percents to calculate how much of each dollar EISD receives goes to a specific area. To see how each dollar is spent in EISD, click on the link below. If you have any questions, please do not hesitate to contact me at cholcombe@eustaceisd.net. Author Coy HolcombePosted on December 14, 2011 Categories GeneralLeave a comment on Where Does a Dollar Go in EISD? I learned yesterday that our Middle School band director, Jim Taylor, has had one of his original music pieces published! On behalf of the district, we congratulate Mr. Taylor on this great accomplishment! A reminder that we will have basketball games here tonight. The boys will be hosting Grand Saline and the girls will be playing their first district game against Buffalo. The 9th and JV boys will be playing in the old High School gym starting at 5:00. The JV girls will be playing in the E. L. Kirk gym at 5:00. The varsity girls will follow the JV girls and the varsity boys will follow the varsity girls. Also, the EHS soccer team will be hosting Sunnyvale tonight starting at 6:00. Author Coy HolcombePosted on December 13, 2011 Categories Superintendent's BlogLeave a comment on Congratulations Mr. Taylor!! Bulldog Band performs several songs at Christmas on the Square. The Kitchen Pantry Scientist not only offers fun, simple experiment ideas, but hot topics of science in the news is also an option on this site, along with the “The World Around Us”, and a video library. The Kitchen Pantry Scientist has been created for teaching kids about science with simple easy things we have around our households. The Kitchen Pantry Scientist would be a fabulous resource for the elementary science class. A special thanks to Larry Ferlazzofor introducing me to this site. First, I want to congratulate everyone that had a role in Christmas on the Square this year. The parade and activities at the square were all great! In addition, the City of Eustace honored Rick and Dianne Shaffer and Cary Reeve for their years of service to the community and to Christmas on the Square. Be sure to check out the videos of the Christmas Parade and the performance of the Bulldog Band at Christmas on the Square on our YouTube channel: http://www.youtube.com/user/EustaceISD. We have 5 days left in the first semester of the 2011-2012 school year. There will be many activities throughout this week. I encourage you to check with your child’s campus for a complete list of activities. 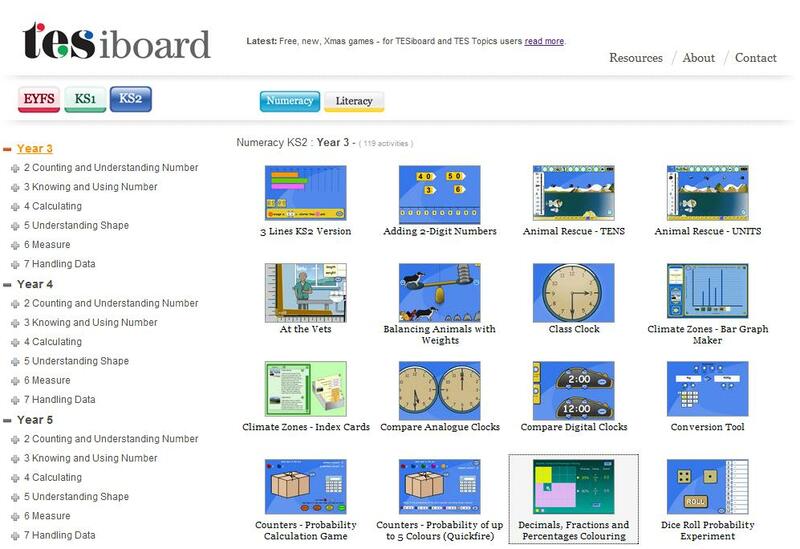 TESiboard is a collection of interactive whiteboard activities that has been made available to teachers for FREE! A product from the UK, TESiboard activities are grouped by years. They don’t correlate perfectly to our grade level system but, when looking for an activity, it will get you fairly close. EYFS might be preschool, KS1 might be Kindergarten through grade 2, and KS2 looks a great deal like our 3rd-6th grades. You can play the activities right from the website or download to your computer. Some of the activities have a “one and your done” page, while others can be played over and over again. Though I have only played with a few of the charts, I believe that this site provides activities for all grade levels through middle school. Several students I shared this with today got caught up playing the TESiboard where you add decimals in order to get enough fuel to launch the rocket. 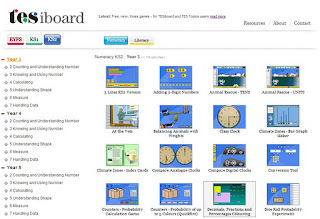 So, if you are looking for a quick interactive activity to practice or reinforce skills, check the TESiboard collection! This great resource was shared today on Twitter by Vicki Davis, the Cool Cat Teacher. Have you checked Twitter today?? 2011 Eustace High School Christmas Concert.